Passion projects are tough to review. 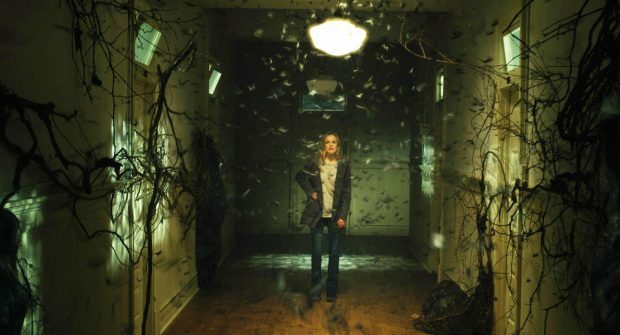 “Before I Wake” is the brainchild of director Mike Flanagan, a veteran to horror, and most certainly a passion project of his own. After years of delays, bankruptcies, and rights being passed from studio to studio, the movie is finally available to American audiences through Netflix. But is this financial risk from one of the most talented modern horror directors actually good? After their son passes away, Jessie (Kate Bosworth, “Superman Returns”) and Mark (Thomas Jane, “1922”) take in a foster child to fill the void in their lives. However, whenever Cody (Jacob Tremblay, “Wonder”) falls asleep, his dreams become reality, including his nightmares which brings to life the Canker Man, a monstrous being who kills anyone near Cody while he sleeps. What’s fascinating about “Before I Wake” is the moral dilemma the characters find themselves in. When the parents’ deceased child starts appearing through Cody’s dreams, Jessie begins to exploit Cody so she can spend time with her son at night. This need to be with him drives her to force Cody to sleep, something the child desperately needs but is scared to do. This dichotomy of morals begs the question: is it okay to do something right for the wrong reason? Add in the potential danger of the Canker Man showing up and the dilemma facing the protagonists becomes even more morally dubious. Unlike other horror films by Flanagan, which rely on well-crafted scares and claustrophobic sets to engage the audience, “Before I Wake” focuses much more on the beauty of the story and the relationship between the child and his foster parents. That’s the true strength of this movie. The characters have their own personal struggles and imperfections that make them wonderfully relatable. These family dynamics are front and center for the bulk of the film, making the movie strangely hypnotic. The climax, however, turns a blind eye to the film’s strengths, ending in a bizarre series of weak scares. It feels more like a haunted house attraction where the audience is taken from one spooky room to the next rather than a horror film with anything genuinely frightening. That’s the major issue with “Before I Wake.” Its ending only brings to light the fact that this film isn’t even remotely scary. While subtle scares hidden in the background are plenty and strong, any other moment of terror is undermined by the weakly implemented Canker Man coupled with some poor editing and cinematography. There are some minor issues that I can’t ignore either. While the Canker Man looks awesome and is animated very well, shots where he’s CGI look awful. Along with that, the unknown plays a huge part in scaring audiences. It’s such a shame that “Before I Wake” didn’t approach the monster this way because when the Canker Man is on screen, he’s completely shown in the light throughout the entire film, lessening any dread that he may have created. Since the movie is only available through Netflix, I’d say there’d be nothing wrong with checking it out. It’s a beautiful movie though it lacks anything scary. It’s by far Mike Flanagan’s worst movie, but even then, it’s far better than most horror movies on streaming services. But if you haven’t seen his other works like “Hush” or “Gerald’s Game” on Netflix, make those films your priority.